Laika in a mockup Sputnik 2 capsule before launch. Special Containment Procedures: SCP-2624 is designated to civilian sources as a piece of space debris. All civilians who travel above low Earth orbit are to be interviewed upon landing for evidence of having experienced or seen SCP-2624-1, SCP-2624-2, or SCP-2624-3 and, if necessary, given targeted amnestic treatment. For space missions which involve the live transmission to the public of video or audio from the spacecraft, the Foundation is to, through computer generated imagery or through recreation with actors and models on soundstages, create alternate recordings of the mission in question to be disseminated in the case that the original mission is interfered with by SCP-2624-3. Description: SCP-2624 is an artificial satellite of Earth, composed of approximately 60 living dogs assembled in a roughly spherical shape 5m in radius around the presumed remnants of Sputnik 2. 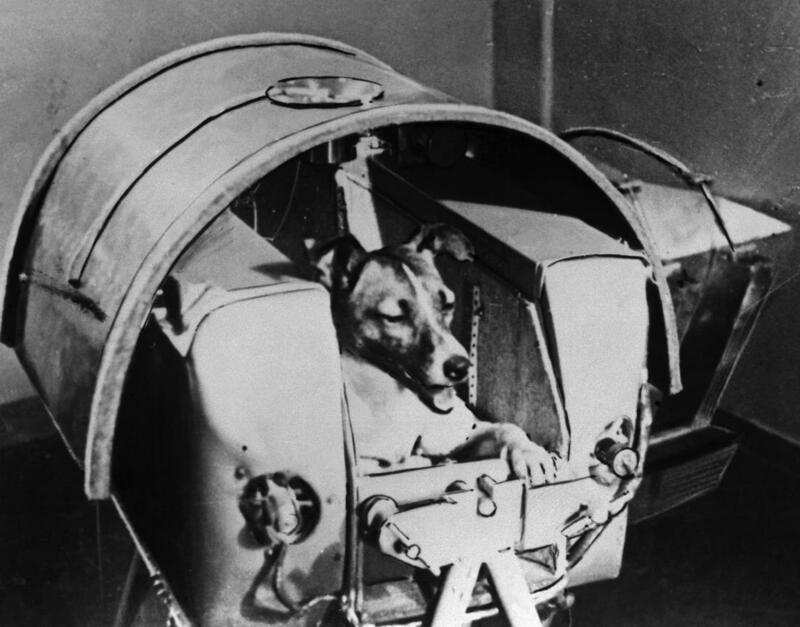 Each constituent dog appears to be an adult, mixed-breed female, visually identical to Laika, the canine test subject of Sputnik 2 and the first animal to enter orbit around the Earth. SCP-2624 was first designated shortly after the launch of Sputnik 2 by the USSR on November 3, 1957. Upon reaching orbit, the craft suffered from severe overheating issues that led to Laika's premature death. At this point, anomalous dogs began to manifest on the exterior of the probe, forming a sphere over several hours. It was only several days later, when the spheroid had fully manifested, that the Foundation was contacted by leaders of the Soviet space program and notified of the situation's anomalous nature. It is believed that SCP-2624 was the result of a malfunction within a paratechnological communication system, meant to be clandestinely tested on behalf of Soviet parascientists during Sputnik 2's mission. It is unclear whether the malfunction was a result of Soviet error or of sabotage by United States intelligence agencies. The dogs that compose SCP-2624 appear to be living, in that they may be observed twitching, panting, and breathing. They do not otherwise move on the surface of SCP-2624. SCP-2624 is capable of ejecting singular dogs at velocities exceeding 10 km/s as propulsion to alter its orbit and counteract orbital decay. It is believed that SCP-2624 anomalously replenishes its population of dogs following propulsion sequences. All attempts to make physical contact with SCP-2624 by any means have resulted in SCP-2624 propelling away from the object in this manner before it can make contact. SCP-2624-1: Approximately 80% of people who have traveled to space post-SCP-2624 have reported intermittently hearing faint noises similar to the sound of dogs barking. SCP-2624-2: Approximately 40% of people who have traveled to space post-SCP-2624 have reported vivid dreams in which a dog or group of dogs visually similar to Laika attempt to explain the workings of unidentified complex machinery to the dreamer. Due to the dogs' lack of vocal cords or opposable thumbs, these dreams primarily consist of them destroying the machinery in question with their teeth while barking incessantly. SCP-2624-3: On at least three separate occasions, fully animate dogs identical to Laika have appeared in space or on celestial bodies. These incidents are enumerated in Addendum 2624-1 below. As such, SCP-2624 poses an increasing threat to normalcy as space travel becomes more commonplace. Proposals to decommission SCP-2624 are under consideration. SCP-2624-3's first known manifestation occurred during the flight of Vostok 1, the first Soviet mission to orbit a manned spacecraft, crewed by Yuri Gagarin on April 12, 1961. Upon achieving orbit, Gagarin reported seeing a single dog floating just outside the porthole of the Vostok. Gagarin recollected afterwards that the dog placed its paws against the porthole and tapped on it rhythmically while peering within. This continued for several minutes before the dog floated away. A significant SCP-2624-3 manifestation occurred during the Gemini 4 mission launched by NASA on June 3, 1965. During Edward White's spacewalk, a malfunction in his Hand-Held Maneuvering Unit caused him to be thrown unexpectedly around the spacecraft, impacting the ship's side and stressing the umbilical air tether connecting him to the ship. While White's crewmate, James McDivitt, attempted to reel him back to the hatch, White reported seeing a dog matching Laika's description in front of him, before feeling a distinct force pushing on his back, maneuvering him towards the hatch of the spacecraft, where White was recovered. The SCP-2624-3 instance was not seen by McDivitt. This is the only known occurrence in which an SCP-2624-3 instance made contact with a human. SCP-2624-3 was next documented by Alan Bean while on the surface of the Moon on November 20, 1969, during the Apollo 12 mission. While on spacewalk, Bean noticed a dog matching Laika's description in the distance, running in a small circle. The dog then ran over to Bean, sitting and looking up at him from several meters away. Bean turned around to verify the location of his crewmate Charles Conrad, but when he turned back, the dog had vanished, leaving no traces. SCP-2624-3 may have manifested on the surface of Earth on February 20, 2000. Moscow City Police reported finding a dog similar in appearance to Laika whining loudly while lying in front of the grave of Vladimir Yazdovsky, a Soviet scientist who led the Sputnik 2 program, in Donskoye Cemetery. A police officer attempted to shoo the dog away, but became surrounded by a mob of identical dogs, who had come running from elsewhere in the cemetery. As they barked at the officer, each instance began to hover into the air. After several seconds, all instances vanished in a flash of white light. The incident was picked up by several local news agencies before suppression by the Foundation.